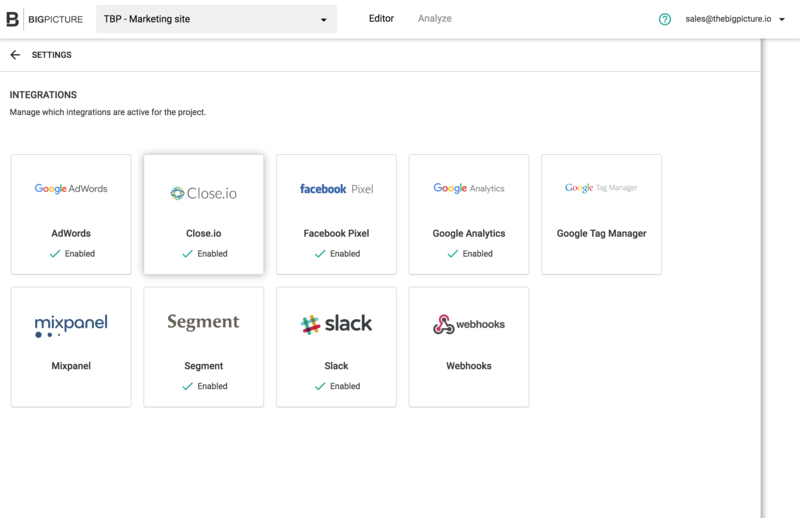 BigPicture.io makes it easy for marketers to setup website tracking and integrate with hundreds of tools without having to write a line of code. With BigPicture.io’s point & click editor you can quickly track anything, at any time, and send your data anywhere - without having to ask a developer for help. The best way to describe BigPicture.io is something like an advanced, visual tag manager. Whenever you want to add a new tool or integration to your website, such as Google Analytics, Facebook, or ActiveCampaign, each of those products will give you a tag (also called a snippet or script). Typically, you'd have to copy and paste this into the HTML of your website, which can be a bit challenging if you're not very technical. BigPicture.io provides a simple UI where you can add new integrations simply by turning them on. When an integration is activated, BigPicture.io will handle loading the tag onto your website along with any other options you configure. Previously, once you installed a tag to your website, that tag is only preconfigured to track very basic user actions - page views. If you want to do anything more advanced, like track a button click, well good luck. You have to code that, or find a developer who can. BigPicture.io is almost like a smart "layer" on top of your tools and allows you to track actions via a simple point-and-click interface. Instead of having to write code over and over again for each integration, we provide a single interface to manage everything. Then behind the scenes, we will normalize your data to the correct format for each integration and send your data for you.